calories are released from the cooling fluid into the environment. materials used (concrete, wood…) in the circuit’s construction. 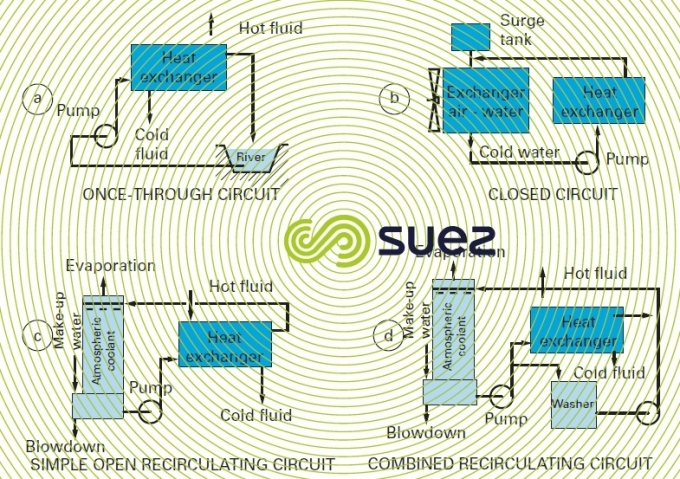 is cooled through partial evaporation in an atmospheric coolant before being returned to the equipment: this is an open recirculating circuit. 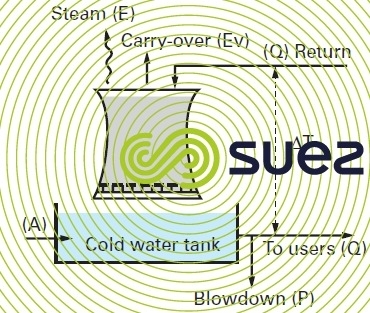 Once-through circuits (figure 16-a) requiring large quantities of water and creating major "heat pollution" are now often restricted to older systems or to systems using seawater. In closed circuits (figure 16-b), i.e. closed and without evaporation, very little make-up water is required (leaks) but this system has a limited thermal efficiency. That is why these systems are mainly used on smaller circuits or on special applications. 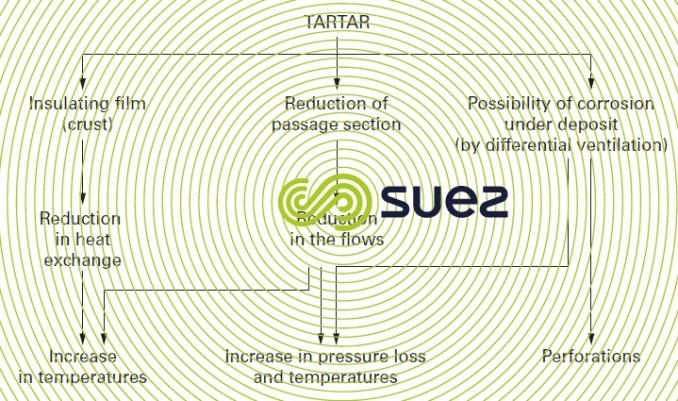 Therefore, open recirculating circuits (figure 16-c) are the most widely used because they have less of an impact on the environment than once-through systems and are more cost-effective than closed systems. There are also so-called combined open recirculating systems (figure 16-d) where water can also come into direct contact with pollution created by the processes (e.g. gas scrubbing). Q(m3·h–1), hot water circulation flow returned to the coolant. ΔT(°C), temperature difference between water entering into and discharged by the coolant. T max. (°C), temperature of the water film («skin» temperature) in contact with the circuit’s hottest wall. E(m3·h–1), evaporation flow, i.e. the amount of water evaporated in order to cool flow Q.
Ev(m3·h–1): drift loss flow. This is the water entrained in the air flow in the form of droplets. Therefore, this flow consists of water which, when analysed, produces the same results as the circulating water. The make-up water flow must compensate for all water losses throughout the circuit: total deconcentration and evaporation. C: concentration level. This refers to the ratio between the levels of dissolved salts found in the water circuit S and in make-up water s (but also the ratio of the make-up flow over the total deconcentration flow as seen earlier). 46-47 m3·s–1 for a nuclear power station operating at full load (1,300 MW), T∆=12.6°C. 2.4 to 3.6 m3·h–1 per MW. 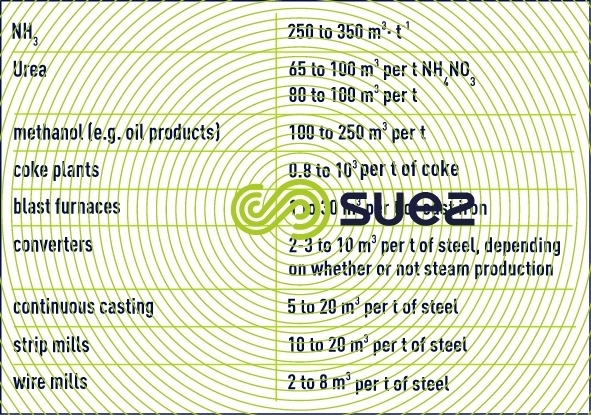 The following table provides some idea of the magnitudes of circulating volumes for certain processes (excluding gas scrubbing) (table 21). 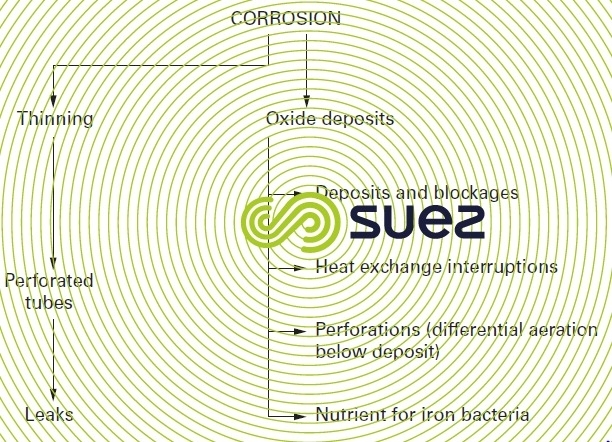 The half-opened circuit is commonly used, but evaporation in the circuit causes concentration in water to occur, thereby concentrating the potential pollution in make-up water (suspended, colloidal or dissolved solids, micro-organisms, atmospheric pollution) as well as dissolved salts which may cause scaling. These disadvantages as well as the methods to resolve them are explained in more detail in chapter treatment and conditioning of industrial water.